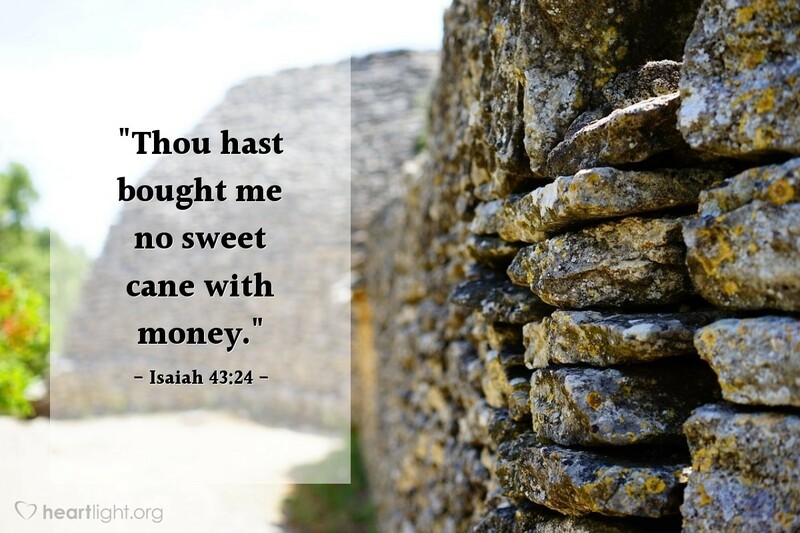 "Thou hast bought me no sweet cane with money." Worshippers at the temple were wont to bring presents of sweet perfumes to be burned upon the altar of God: but Israel, in the time of her backsliding, became ungenerous, and made but few votive offerings to her Lord: this was an evidence of coldness of heart towards God and his house. Reader, does this never occur with you? Might not the complaint of the text be occasionally, if not frequently, brought against you? Those who are poor in pocket, if rich in faith, will be accepted none the less because their gifts are small; but, poor reader, do you give in fair proportion to the Lord, or is the widow's mite kept back from the sacred treasury? The rich believer should be thankful for the talent entrusted to him, but should not forget his large responsibility, for where much is given much will be required; but, rich reader, are you mindful of your obligations, and rendering to the Lord according to the benefit received? Jesus gave his blood for us, what shall we give to him? We are his, and all that we have, for he has purchased us unto himself -can we act as if we were our own? O for more consecration! and to this end, O for more love! Blessed Jesus, how good it is of thee to accept our sweet cane bought with money! nothing is too costly as a tribute to thine unrivalled love, and yet thou dost receive with favour the smallest sincere token of affection! Thou dost receive our poor forget-me-nots and love-tokens as though they were intrinsically precious, though indeed they are but as the bunch of wild flowers which the child brings to its mother. Never may we never grow [stingy and reluctant] towards thee, and from this hour never may we hear thee complain of us again for withholding the gifts of our love. We will give thee the first fruits of our increase, and pay thee tithes of all, and then we will confess "of thine own have we given thee."